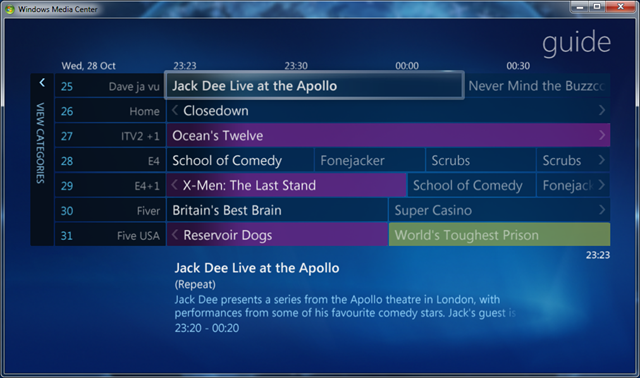 In this post, I’ll discuss my experiences on building a robust, high-speed and high-definition media setup in your home, using Windows 7, Xbox 360 and Windows Home Server. If you’d like to leave a comment when you’ve read this post letting me know what you’d like to see more of (or less of), I’ll make sure I address that in either an edit to this post, or a brand new one. Thanks! Feel free to skip to the section that interests you most. At the weekend, something happened that rocked my world. It didn’t happen accidentally, either. I was out shopping and I just happened to walk past Maplin (RadioShack, to you US folks) who had a special offer in their window: a KWorld PlusTV DVB-T Dual Freeview HD Tuner for the princely sum of just £24.99. That’s a small USB stick with an antenna connection on it that contains not one, but TWO HD Freeview TV tuners, giving the ability to watch one programme while recording another: for £24.99. In the UK, Freeview gives access to about 100 digital channels, and, although they don’t broadcast in HD yet, in early 2010 the HD rollout begins. Right now, the only way to get free HD TV over the air is to get Freesat HD or Sky+ HD, both of which require a satellite dish to be installed and cost a fair amount in set up and subscription fees. At the time, like many geeks, I didn’t know why I wanted this particular gadget, but I the little voice inside of me compelled me to buy it. I figured, “hey, even if I don’t know what to do with it, perhaps Windows 7 will”. And that is where the fun began. With the recent release of Windows 7, millions of people globally have been busy remarking how much simpler the ‘simple’ things become when you install Windows 7. Unlike Apple (for whom I shall now depart momentarily to direct a slight dig) who only have to worry about a limited number of devices on a limited platform of hardware, Microsoft have to build software that is actually compatible with hundreds of thousands of different devices and at least twice as many combinations. That is by no means an easy thing to accomplish, but Windows 7 seems to do it with dare I say it a certain degree of sentience: plug and play has actually come to life. Everything… every single USB gadget I own was detected first time, without me first needing to supply a driver CD. If Windows didn’t have the drivers, it ‘magicked’ them off the internet for me. Marvellous. This includes the £24.99 TV Tuner from some anonymous company I’ve never heard of before. I plugged it in, and up popped the “Driver Installation” window and it downloaded the relevant drivers for me (I’m so glad it did as well – I don’t like installing drivers and software from anonymous small name companies). A few minutes later, everything was successfully installed with zero effort on my part. In fact, the most strenuous part of this entire exercise was trying to open the box the device came in – which was apparently designed to survive a small tactical strike. And this is where Windows Media Centre comes onto the scene – an incredible suite of technologies that’s designed with simplicity in mind. Shipped with Windows 7 Home Premium and Ultimate editions, Media Centre has – at its core – the ability to act as a centralised hub for all your digital media: music, videos, recorded and live TV. For anyone who’s seen TiVO or Sky+, Windows Media Centre does exactly what those two services do, but better, faster and subscription free. 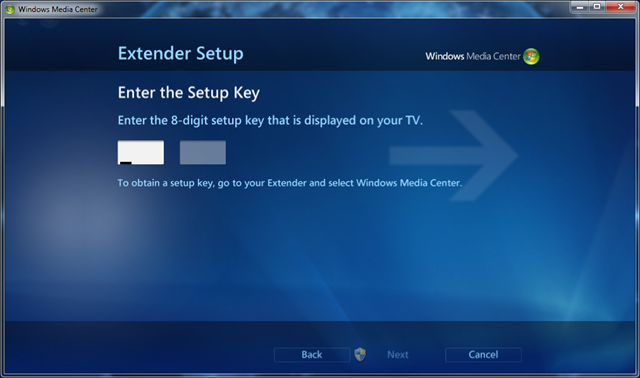 Having detected that I had now installed a USB TV Tuner, Windows Media Centre asked me if I wanted to configure it. Allow it to complete the setup process, which – including the time it takes Media Centre to scan the TV frequencies in your country for available channels – took me about 10 minutes. The trouble is right now – this is TV on my PC. My PC is in my office – not my front room. We need to break out of here and I’ll be damned if I’m going to run a VGA cable from here to my 42” LCD TV in the front room. Nay – I want an easier way! Those of us with an Xbox 360 (or three) laying about the house know that we’re supposed to be living in some futuristic media-utopia where our TV’s can access all our music, videos and photos. Even TV (alright, that’s slightly pointless but you get the picture). But, even with Vista, this wasn’t particularly easy to set up. So I never bothered with it. It just didn’t quite work as expected. 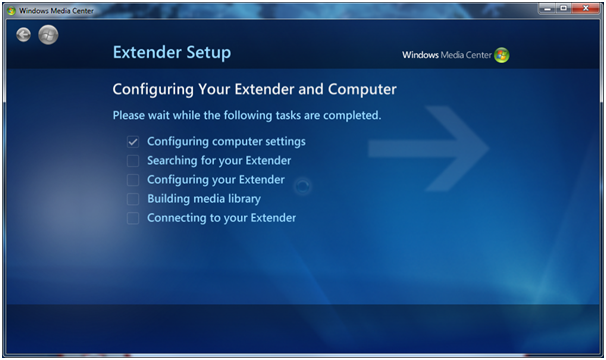 Turn on your Xbox 360 while your Windows 7 PC is on, and you’ll receive a polite little notification that “Windows has discovered a Media Centre Extender”. Discovery – what an appropriate word. It popped up, and I thought to myself …. “Please, continue”. And so Windows did. After being informed a few seconds later that everything was installed correctly, I wanted my Xbox 360 to be able to access the juicy goodness of Windows Media Centre. If you’ve already set up (or tried to set up) a Windows Media Centre connection before, you’ll first want to choose “Disconnect”. If you’ve not tried that before, that option won’t be available to you. 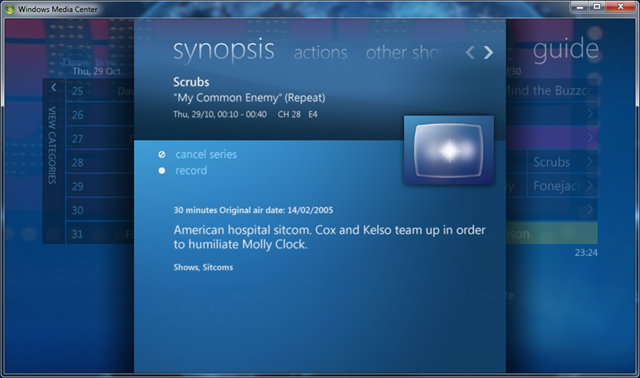 Your Xbox 360 will search your network for available Windows Media Centre computers. After a few moments, your Windows 7 Media Centre should be discovered, and your Xbox 360 will display a two-part eight digit code on your screen. 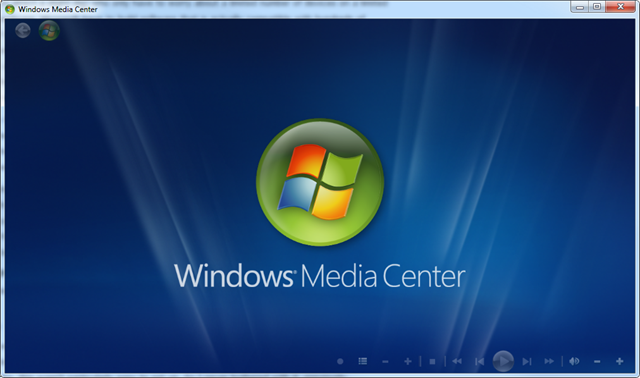 Note that code down, and fire up the Windows Media Centre application on your PC. Type in the eight digit code you were given by your Xbox 360, and press “Next”. This process might take a little while to complete while your Media Libraries are constructed. By this time, your Xbox 360’s display will have changed and will be displaying a very similar (if not completely identical) display to the Windows Media Centre application on your PC. 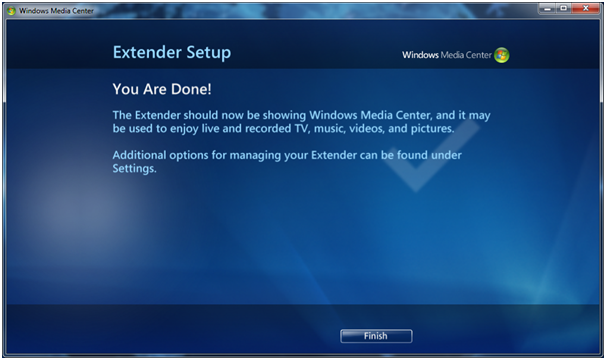 And that’s it, you’re done – your Xbox 360 is now connected to your Windows 7 Media Centre. What about Windows Home Server? Ah, the “server in the home”. Got one? I have. If you haven’t, you should. It takes care of backing up all your PCs, laptops and personal devices and my HP MediaSmart Home Server even automatically backs up my iTunes Libraries and streams them over the network. In fact, they’re so good I’d recommend them even for small businesses. Just plug them in, install the software on your PCs and laptops and you’re safe from day one (you can even do a bare-metal rebuild if you are running Windows 7 – that rocks). Even cooler is that with the PowerPack 3 Beta recently released by Microsoft you can now install a connector for Windows Media Centre that allows it to take full advantage of the awesome storage capacity of your Windows Home Server. 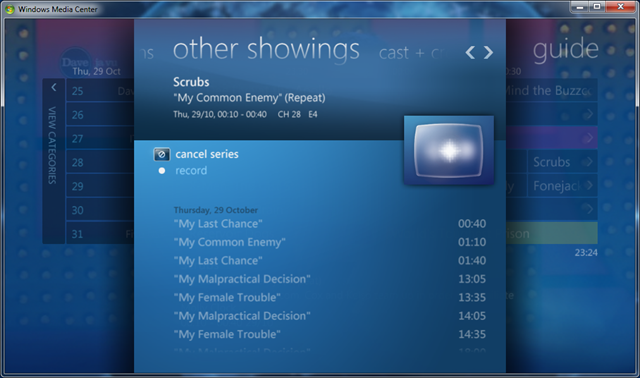 The Windows Home Server Media Centre Connector (desperately in need of a shorter name, though it is hard to imagine one more descriptive) adds a little tab to your Windows Media Centre menu that, in a nutshell, allows Media Centre to archive your recorded television programs off to your Home Server automatically. It also adds some other nifty functionality to allow you to view most of the information contained on your Home Server Console on your TV, too. It starts with the purchase of a TV tuner ‘dongle’. With Windows 7, in literally just a few minutes you can pretty much overhaul the way you access your digital content in the home. Chuck an Xbox 360 into the mix, and you’ve got the capability to stream HD content to your TV, listen to your music and browse all your photos right from the comfort of your armchair. I’d also recommend getting your hands on a great media remote (this one from Logitech is awesome) because you’ll quickly get bored using the Xbox 360 controller. The Logitech remote can also control many other devices so you can ditch the collection of remotes you’ve probably already got. With Windows Home Server chugging away too, you’ll never lose any of your digital recordings again and since storage is so cheap these days, you’ll have a very easy mechanism for expanding your storage on demand.